Prevents the full force of wind and/or rain directly penetrating into the dwelling, which can cause extensive damage to plasterwork and decoration, and discomfort for the tenant. The Dri-Cowl when fitted will still allow adequate ventilation to flow freely. The strengthening bottom bar also prevents “runup”. 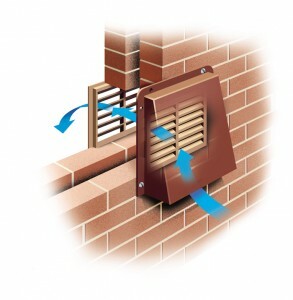 The fitting of Dri-Cowl does away with the tenants overall psychological need to internally block off the air brick, which negates its function and could cause hazardous air pollution and fumes. Dri-Cowl is also invaluable when used as a cover for extractor fans, as in windowless bathrooms, extras to kitchens etc., eliminating draughts and irksome “Blade” noise and allowing the fan to fully function even against strong prevailing winds. Dri-Cowl is manufactured from high quality aluminium and finished in brown and comes complete with fixings. The Dri-Cowl is easily fixed on site using screws and silicone/polysulphide mastics. For more details please contact Stuart or Phil on 01942 715678, who will be able to answer any questions you may have. This item and many more are available in our online shop, see the categories to the right or click ‘Shop’ at the top of the web site or by clicking the link below.